HATHERLEIGH BAND is one of the oldest organisations in the town and one of the oldest bands in the county of Devon. As early as 1827 there is a record of a band playing as the Duchess of Clarence (later Queen Adelaide, wife of William IV) passed through the town on the way to stay with Lord Clinton at Heanton Satchville after opening the new Laira bridge at Plymouth. The Volunteers were formed in the town and in 1860 a band attached to them gave its first public performance. From then on the band accompanied them as they marched to various places and functions. In the Parish Magazine, complied by the Rev. Banks from 1879 onwards, the names of various bands appear for Holy Thursday; the Volunteer Band, at one time there was a Salvation Army Band, a Temperance Band (formed by the Band of Hope) as well as many Jazz Bands. A band played for Major Pearse on his return after winning the Gold Medal at Creedmore in America and, in 1883, for Mr & Mrs Oldham on their return from honeymoon. In 1886 a Fife and Drum band made a fresh start under the leadership of John Chapple. 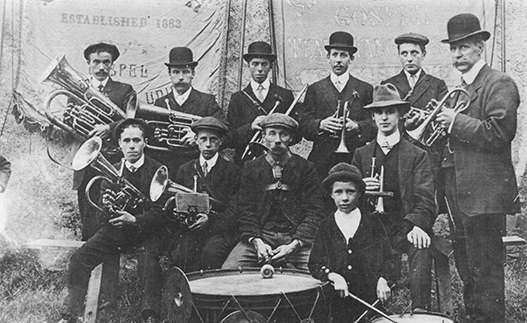 After the volunteers were disbanded, and at some time before 1909, Mr Turner formed a Town Band. The band would play for circuses when they came to town, when footballers won a trophy and on Royal occasions, Coronations and Jubilees. In the 1930s the bandmaster was Parson Ledbury of Meeth and the training officer was ‘Soldier John’. The band always played for the 4th of June Club and there was always a race between the band and the bell ringers to see who could start playing first. It was known for both to be playing at 6 o’clock in the morning. The main incentive was a free meal and drink at The Royal Oak for whichever started first. The band disbanded with the outbreak of the Second World War. After the war the band held open air dances every Saturday night in the square. Unfortunately, from then – the late 1940s – through to the 1960s very little is recorded or known about their activities. During the 1960s and early 1970s Bill Crocker, a prominent local businessman and dance band leader, took over as Musical Director and considerably raised the profile of the band. In 1977 the then president, Mr Tom Vallance, presented all members with a certificate for winning four competitions in one year. In 1982 the band made a record called ‘Silver Sounds of Devon’, the recording taking place in the Primary School Hall. The music for the record was compiled by asking members to write a list of what they thought should be recorded with the most popular being chosen. In 1983, Mr Robin Wonnacott, who is Hatherleigh born and bred, was appointed Musical Director and continued to improve the standard of the band making them the envy of the area. During 1988 the band recorded the signature music for ‘Farming News’ which was broadcast by Television South West. As well as their television debut the band have regularly featured in broadcasts from BBC Radio Devon. 1990 saw the band enter and a win a contest at Pontin’s Holiday Camp in Weston-Super-Mare. This enabled the band to qualify, and represent Devon, at the National Finals held at Prestatyn in North Wales. A fund raising event for the trip to Wales, in the form of a sponsored cycle ride from Lands’ End to Hatherleigh, was organised. Two tandems were used and the journey was completed by Michael Isaac, Jason Doidge, Mark Quick and Ian Bryant raising the magnificent sum of £1,000. In June 1991 the band entered the annual contest held at Bugle in Cornwall and 1st prize was won. On the 20th June 1992 the band returned to Bugle to defend their title and were successful in winning the ‘Bolitho’ shield playing a test piece entitled ‘Suite for Switzerland’ by Roy Newsome. The band also took 3rd place in the deportment class. The band also won 1st prize at the SWBBA spring festival at Barnstaple with the march ‘Cardiff Castle’. In 1993 the band recorded their first cassette ‘Devon Fantasy’ and 1000 copies were sold. In 1994 another cassette was recorded (in the Town Hall, Hatherleigh) named ‘One Moment in Time’; this was to celebrate the bands’ qualification for the 1994 National Brass Bands Championships of Great Britain held at the Wembley Conference Centre in London with the band achieving a very creditable 10th position and promotion to the 3rd Section in 1995. In the years leading up to the Millennium the band, still under the baton of Robin Wonnacott, enjoyed continued success on the contest stage as well as entertaining countless numbers at Concerts, Fetes and Carnivals. A CD was recorded in 2001 which was named ’No Matter What’ a poignant reminder of the bleak spring of 2001 which saw Hatherleigh at the epicentre of the terrible Foot and Mouth outbreak. In 2002 Robin Wonnacott relinquished his duties as Musical Director to concentrate more on playing in the band. Mr Adrian Edwards, a very talented musician and local butcher from Brickyard Farm, was appointed Musical Director. During 2003 the band continued with contesting success entering contests at Bugle and Weston-Super-Mare. The band also made their debut at, and won a prestigious 10 piece competition held at Corsham in Wiltshire. In June 2006 the band won 1st place in the Bugle Band competition in Cornwall by 3 clear points. 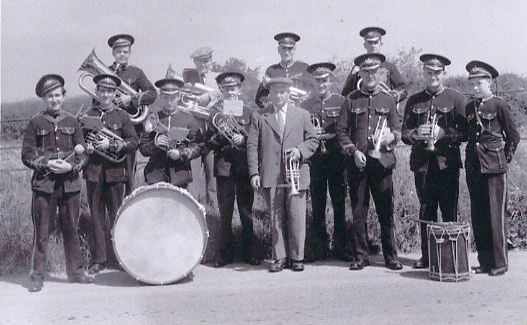 Several members had joined the senior band from the training band; many having been trained by Adrian Edwards. 2008 saw Robin Wonnacott return as Musical Director and in 2009 a decision was taken to employ the services of a professional conductor, Mr David Hayward. David’s partnership with Robin proved very successful with the band being crowned 4th section champions at the SWBBA annual contest playing ‘Four Little Maids’ by John Carr. In March 2010 David Hayward led the band at the West of England Regional Qualifying contest at Torquay gaining 2nd position and qualifying for the National Finals to be held in Harrogate. A summer of hard rehearsal and fund raising followed culminating with the band attending the National Finals at the Harrogate International Centre on 25th September 2010. The band again attended the ‘Regionals’ at Torquay in March 2011 and, led by David Hayward, once again qualified for the National finals in Cheltenham playing ‘Prelude, Song and Dance’ by John Golland. Another summer of rehearsal and fund raising followed and the band is deeply indebted to generous public support which enabled them to attend the finals at Cheltenham Racecourse Conference Centre in September 2011. The band does have an active life outside of contesting playing at many, Fetes, Carnivals, Coffee Evenings and Concerts. In 2014 they played at Iddesleigh, the home of author Michael Morpurgo, for the opening of the War Horse Museum with ‘Joey’ the life size puppet horse from the West End of London in attendance. In 2014 Robin Wonnacott again relinquished his position of Musical Director to concentrate on his beloved Tuba. Mr Tom Griffin RM was appointed but his tenancy was short lived due to a military posting away; Tom was followed by Mr Dan Button RM but, once again, Dan was posted away and was unable to continue. In 2014 the band took the decision to purchase a new set of uniform consisting of Black Blazers and Shirts for Concert and Contest use with the bands’ traditional Maroon uniform being retained for marching engagements. Autumn 2015 saw the appointment of Mr Matthew Green, a very talented Royal Marine Musician, as Musical Director. The Hatherleigh Silver Band was Matt’s first venture into conducting and he was an instant success. The band entered the SWBBA Annual contest at Torquay in November 2015 gaining an excellent 2nd place. They then entered the Regional Qualifier at Torquay in March 2016 winning the 4th section, qualifying for the National Finals, playing ‘The Journal of Phileas Fogg’ by Peter Graham. The finals were held at Cheltenham Racecourse on 17th September 2016 which saw the band, under the baton of Matt, gaining an incredible 3rd place – there were 18 other bands in the section- area winners from England, Wales and Scotland. The set piece was ‘Music from Kantara’ by Kenneth Downie.